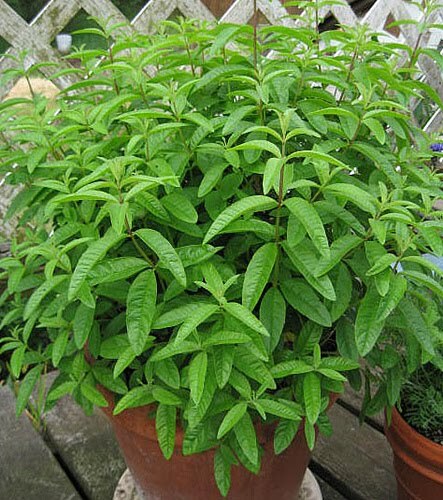 Lemon Verbena was brought to Europe by Spanish explorers in the 17th century from Argentina and Chile. There it was grown for its fabulous lemony oil that was used in perfume and beverages until cheaper Lemon Grass oil replaced it. Aloysia triphylla is named after Maria Louisa the princess of Parma and wife of King Carlos IV King of Spain and it has whorls of three (tri) leaves (phylla). It is commonly used by Europeans to flavor fruit-based drinks, fruit salad dressings, fish soups, marinades, puddings, jams, and desserts. It does not tend to lose its flavor during cooking. It pairs well with fruits, vanilla, and seafood dishes. You can use lemon verbena in place of lemon zest in recipes. Virtually any fruit salad can be enhanced with its finely chopped leaves. Lemon verbena makes one of the best beverage teas, especially when blended with mint. It can also be used to brighten the taste of fish, poultry, veggie marinades, stuffing, salad dressing, jellies, and vinegar. Finely crumbled dried leaves can be added to the batters of carrot, banana, or zucchini bread. Try adding some to cooked rice just before serving. My lemon verbena is the one thing I can count on to grow wonderfully in my garden no matter what the Georgia weather is like during the summer. Last year I dried it and put it in small containers to give as Christmas gifts. This year I’m doing the same – I already have a gallon baggie full. Not only that, but this morning I cracked open the bottle of vodka that Jack bought for me yesterday (NO, NOT FOR BREAKFAST) and started a wonderful lemon liquor. You take half a cup of leaves (about two large and maybe one small stem’s worth), chop them, and add four cups of vodka. I have two batches going now. They brew for 2 weeks (you shake them occasionally) and you then add 2 cups of sugar, shake and dissolve and let sit at least another two weeks. Then you strain and have a tasty (and quite potent) lemon liquor. I’m going to order some cute one-cup bottles and I’ll have eight Christmas gifts. Well make that seven – I have to keep one for us. And by the way, a 1.75L bottle (Smirnoff grab handle size) yields right at 8 cups of vodka. And…you can bury six leaves in a cup of sugar and have a wonderful lemon sugar in a couple of weeks to put in your tea or use in baking – bet it would be great sprinkled on top of sugar cookies! I have a four-cup container going, and again – the lemon sugar put into small containers (like a salt shaker maybe?) would make great Christmas gifts. Can’t get much easier than that. The biggest bonus is that when you’re chopping or using lemon verbena leaves, your whole kitchen smells really good! Oh and try a few branches in a flower arrangement on your dining table when you have company. Not only are they beautiful but also have a fresh lemon aroma. If the stuff goes crazy, you could make some soaps too,,,at least for YOU! Ohhhhhhh smells like Sunshine! Then draw a bath, pour a liquer and wash away your troubles in a Verbena Bath......doesn't get much better than that, I'd say! Or even just crush the leaves and float 'em in your tub! Ahhhhhhh, Sounds good! I could trade you some of the MINT that I have that goes crazy around these parts! Good morning, I did not tend to the few herbs I had last year, but a few sprigs of mint seemed to have survived despite my neglect. Your lemon verbena looks wonderul. Haven't had any for about 4 years, and when I did have some I - never considered pairing it with the sugar - duh. Enjoyed reading your blog! I'll have to get some lemon verbena, I wish I had some already planted with all your ideas for using it! Have a wonderful week! I just want to thank you SO much for my birthday wishes. That was so sweet of you, and I enjoyed reading this post. I bet that verbena is heavenly. I can smell it now! Wow, what a wealth of information! I don't have a green thumb so love all of the people that grow a glorious garden. I do have some basil I set out to make pesto with, so will be doing some tomorrow. I left a message for you earlier, but I don't see it. Just wanted to drop back by and let you know I joined your site and that I adore your header. It is SO cute and happy. Your verbena story is agin very interesting. I use dried verbena leaves for herb tea.